Each application in your cPanel allows you to customize your website, empowering it with email capabilities and aliases, giving you access to unlimited storage through an FTP server, and protecting your domain through backups and advanced protective software. If you have any questions, or would like to learn about an application not listed, email Learning Design and Technology. To protect your website content, you need to regularly back up your site. There are several ways to back up your content, and we recommend you keep at least three backups. These backups can be stored in places such as on your personal computer’s hard drive, a flash drive, or a CD. 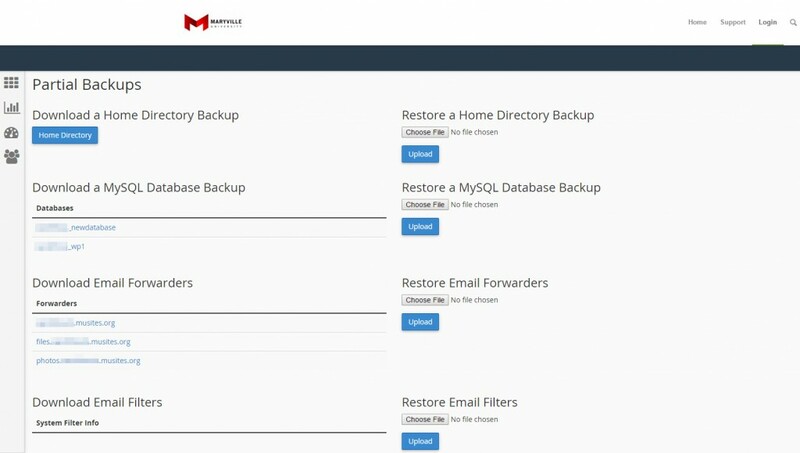 Please note that Maryville University pays for monthly backups of your site. 1. From your cPanel in the Files section, click Backup. 2. Click Download a Full Website Backup. 3. 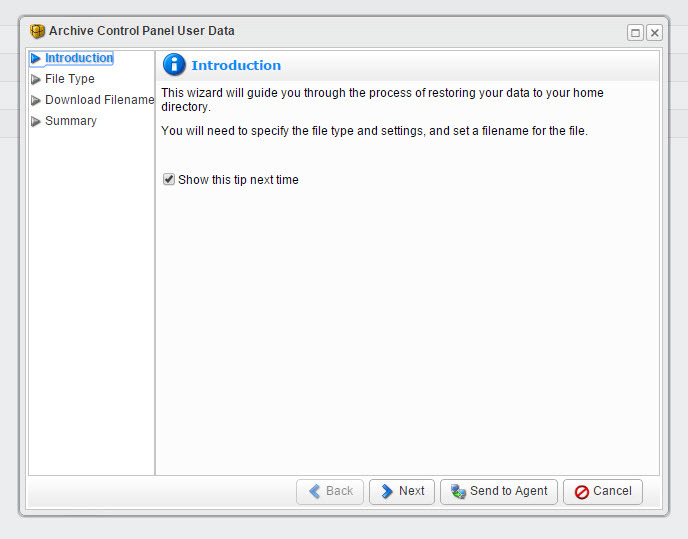 Choose Home Directory from the Backup Destination list, and then click Generate Backup. You can have the backup emailed to you once it’s complete. If your website has a lot of content on it, the backup may take a while. 4. A pending page appears while your backup runs. You’ll receive an email once your backup is complete. This email provides the location of your backup and a raw log file. 5. From the backup pending page, click Go Back. Your available backups appear. Click a backup to download it. Once downloaded, you can save it to a your computer, a flash drive, email, or CD to make it more secure. 1. 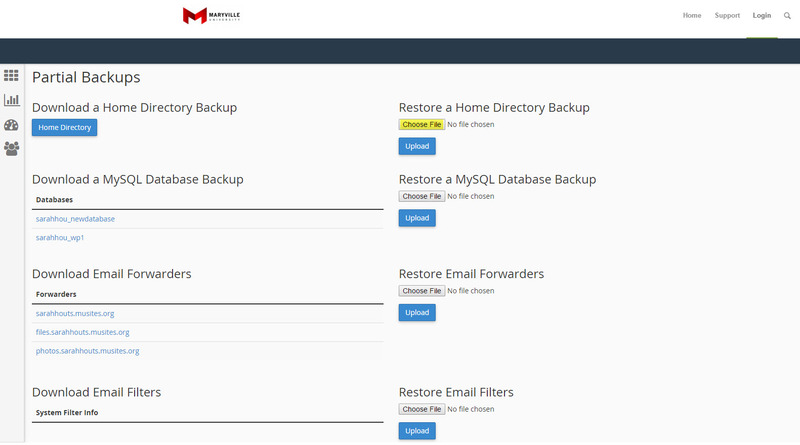 You can back up your Home Directory, MySQL Database, Email Forwarders, and Email Filters by clicking the Backup link from cPanel. 2. Click an individual item to download a backup of it. 3. Once downloaded, you can save the file to your computer, a flash drive, or CD. The following steps walk you through accessing a complete and partial backup restorations. 1. From the Files section, click Backup. 2. For a complete website restoration, click Choose File from the Restore Home Directory Backup section. 3. Browse your computer for the backup file. 4. Click Upload when you’re ready to restore the backup. 5. Your website is restored. The following steps walk you through accessing a backup of your CMS application. 1. To access your CMS application, click your blog link from the Web Applications section of your cPanel. Or, visit domainname.musites.org/blog/wp-admin/. 2. Select the checkbox next to the CMS application. 4. Click Backup again. The backup process will create duplicate files, directories, and database tables. 5. You’ll receive a confirmation email once your backup is finished processing. A link to your backup is included in the email. MU Sites has several automatic backups available to you. If you are using a CMS, such as WordPress or Drupal, then it’s configured to automatically back up any time there’s an update to the application. The following steps walk you through setting up an automatic backup of your CMS application. 1. Select the checkbox next to the CMS application. 3. In the Automatic Backup section, select an option. By default, Do not automatically maintain backups is selected. The following steps walk you through restoring your backups. 2. Click the My Backups tab. 3. Your available backups appear. Restore a backup by clicking the associated arrow. 4. Click Continue to Restore to original location or Restore to new location. 5. Follow on-screen instructions, and then click Restore. MU Sites does automatic server backups using a software called R1Soft. These backups are stored for 30 days. 1. 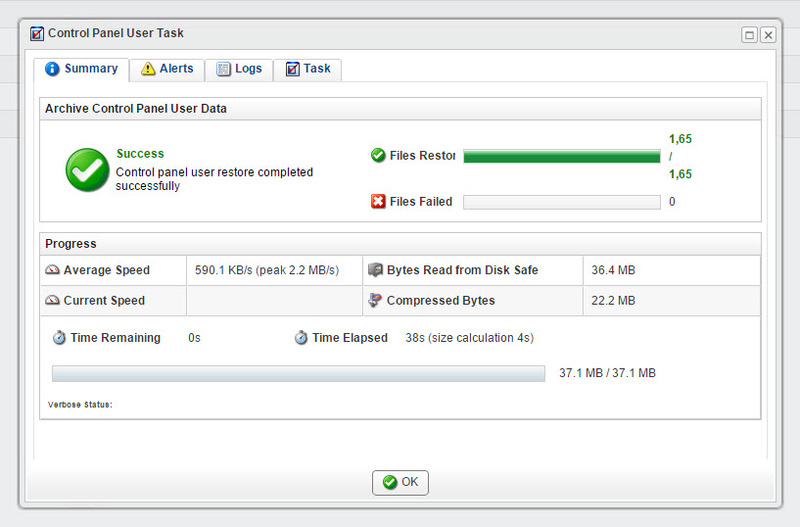 Click R1Soft Restore Backups from your cPanel. 2. The automatic system backups appear. Click the last icon (next to the disk icon). 3. Click Send to Agent. 4. Click OK when your backup is complete.